To request to be added to the mailing list for the J. Devlin Glass Art wholesale product catalog when a printed version becomes available, please complete and submit the form below. 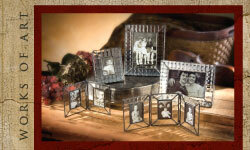 Our catalogs feature our stained glass collection of photo frames, photo boxes, keepsake boxes, ornaments, night lights, lamps, business card holders, clocks, trays, vases, and kaleidoscopes. BE SURE TO PUT YOUR MAILING ADDRESS IN THE DETAILS BOX!